I have actually dreamt about these cookies since making them. 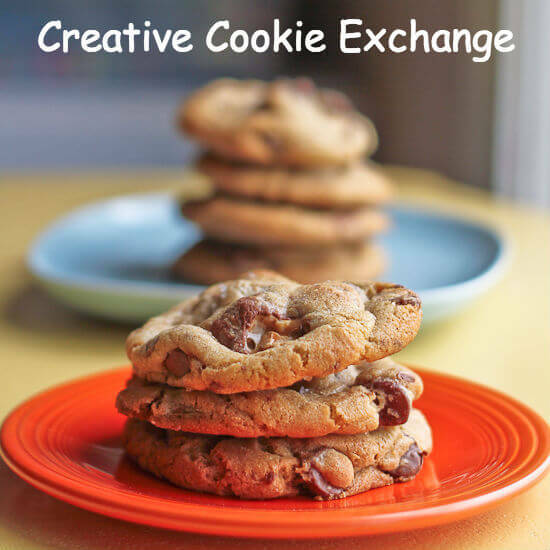 They are hands down the best cookie I have had in ages–which is not to detract from any of the other fabulous cookies I have waiting to share with you. They are good, in some cases amazing, too. But this one, well… Wow. It was the kind of good that leaves you speechless. These cookies also mark the end of a lifelong habit of always avoiding nuts in my chocolate chip cookies. You see, my mom loves nuts. Like, really, really loves them. In everything. And the nut she loves best? Walnuts. As it turns out I am one of those people who really tastes the tannins in walnuts and finds them super bitter. So between avoiding the texture of the nuts (as I said to my mom more than once during my childhood: who wants to suddenly encounter a hard nut that just gets stuck in your teeth when eating something chewy/creamy/what-have-you?) and avoiding specifically the flavor of walnuts, I just stuck to a simple rule of never putting nuts in my cookies or brownies. Whisk together flours, baking soda, baking powder and salt in a bowl. Set aside. Using a mixer fitted with paddle attachment, cream butter and sugars together until very light, about 5 minutes. Add eggs, one at a time, mixing well after each addition. Stir in the vanilla. With speed on low, add the dry ingredients and mix until just combined, 5 to 10 seconds. Mix in the chocolate chunks and pistachios. Cover the dough with something airtight and refrigerate at least overnight (I bake a tray or so a day, until the dough is gone, thereby ensuring fresh cooking each time). 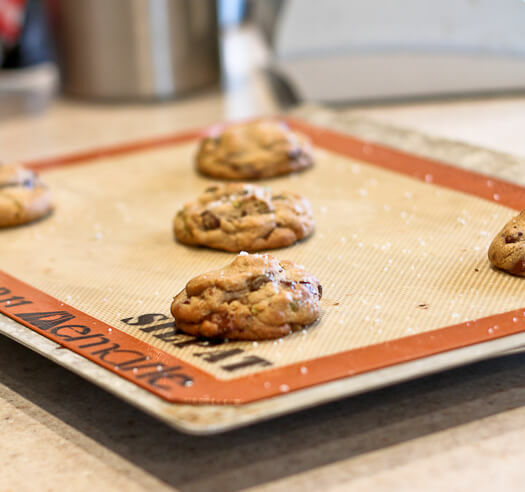 When ready to bake, preheat the oven to 350 F. Line a baking sheet with parchment paper or a silicone mat. 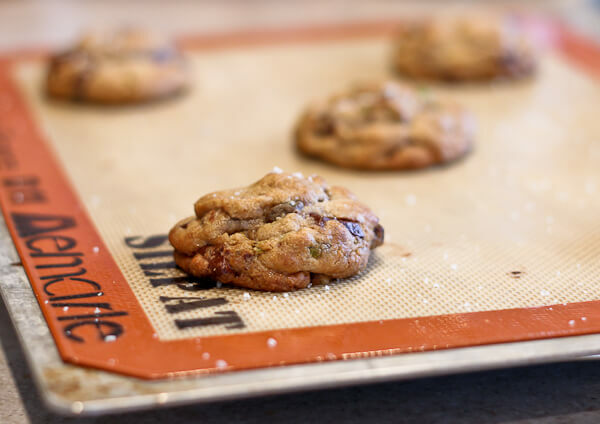 Using a cookie dough scoop or an ice cream scoop of medium size, scoop the cookies onto the prepared tray, 6 per sheet. I was aiming for 2-3 tablespoons of dough per cookie. 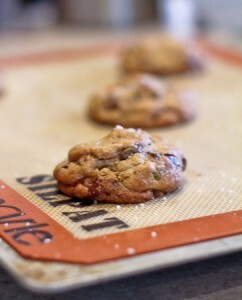 Sprinkle the cookies with sea salt and bake until golden brown but still a little soft, about 13-15 minutes. Transfer the baking sheet to a wire rack for 10 minutes, then remove the cookies individually to a cooling rack. Nothing better than a pistachio in my opinion! 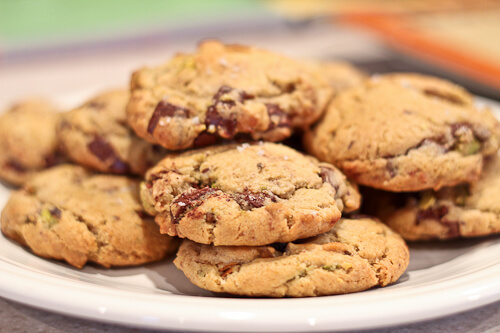 I’m a huge pistachio lover so I’m sure I will be over the moon with these cookies! I made almost these exact cookies a few months back. They were divine!! I tend to avoid nuts in my baked goods also because I hate the interruption of the chewy texture…but I see what you mean about pistachios being more tender. Definitely giving these a try! I’ve always been envious of those perfect cookies- totally gorgeous! The pistachio-dark chocolate combo is a dreamy one! It’s gotta be in my top 10 favourite flavour pairings! I can totally eat a a dozen or so of this in one sitting! Mmmmm. 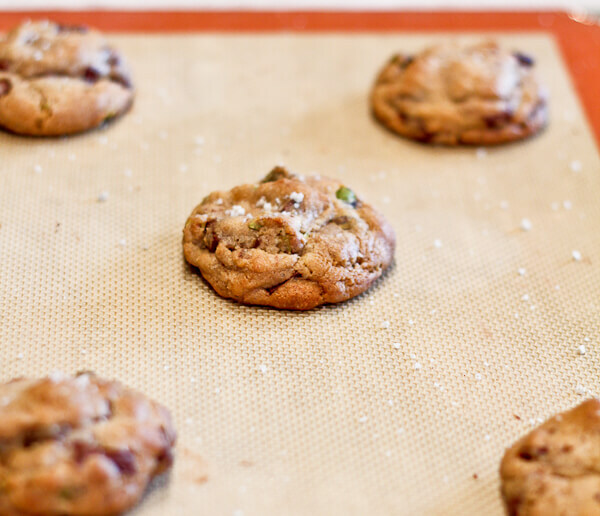 I love pistachios, but I’ve never put them in cookies before. Maybe in biscotti? But not in a chocolate chunk cookie like this. Total genius! I’m pinning this recipe to try soon. Thanks for sharing! Oh my goodness! What decadence! Bookmarking these cookies and will make them for my holiday batch. Thanks for sharing, Laura! 666 park ave has been extremely disappointing to me–so much potential, but i can barely watch it! i haven’t seen the arrow pilot yet but i have high hopes. i am pretty sure you are all walnut bigots. Hi, please let me know what other flour I can use if I cannot find WHITE whole wheat flour? If you can respond asap that would be great as I’d like to bake these on Thursday of this week! Thanks in advance!!! Regular whole-wheat flour will work fine but you will taste the tannic quality of the whole wheat. You can also sub all-purpose flour.